While learning about Torpedoes I discovered that their range (how far they can go on their own power) far far exceeds the range at which they can hit a ship. 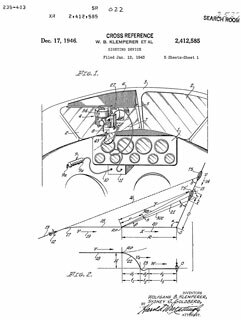 The company that made the Torpedo Data Computer (TDC), Ford Instrument (Wiki, Doug Coward), also made the Gun Director (GD) used on Battle Ships (Wiki). In my opinion those big guns have never hit a moving ship at anywhere near their maximum range of 35,000 yards (20 miles) (Wiki). Note the TDC and GD were there to solve the problem of a moving firing platform targeting a moving ship where the weapon takes some time to move from the firing platform to the target. The weapon is "dumb" in that it does not have any terminal guidance. So the aiming angle and the instant it should be fired must be very precise in order to hit the target. 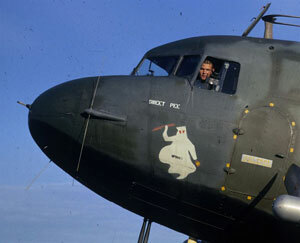 I've seen mention of Gun Bomb Rocket (GBR) aircraft sights. 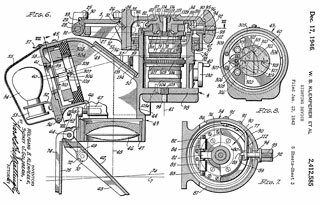 The Nordeen bombsight never worked, it was mostly marketing hype. 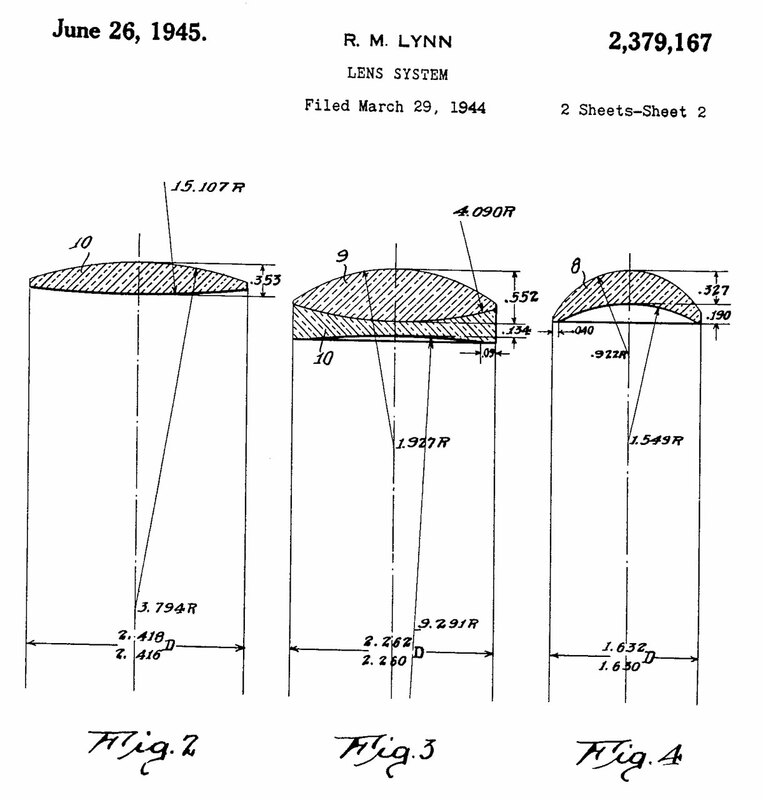 It was developed by the Navy, but after testing they gave up and went to dive bombing (Wiki). Horizontal bombing (Wiki) only works in the "Carpet Bombing" (Wiki) mode which results in high civilian causalities. 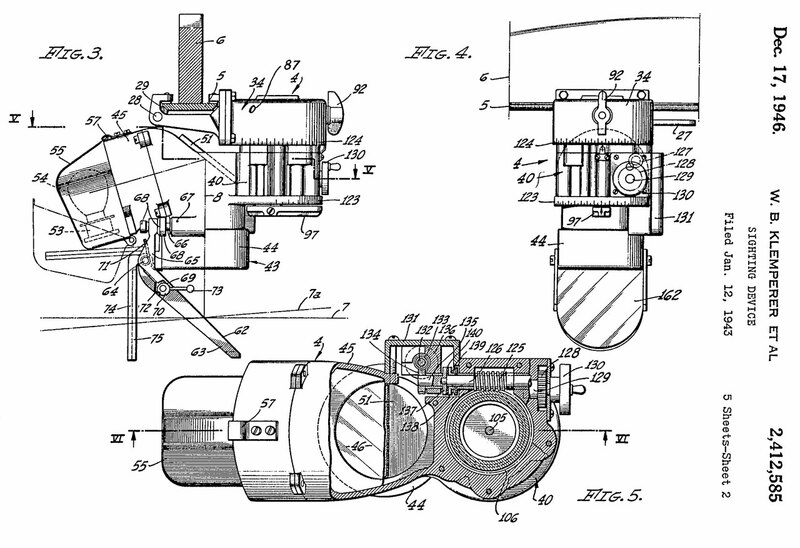 So, what bomb sights were used for dive bombing. They are forward facing unlike the downward looking bomb sights used for horizontal bombing. This sight came after the NC-3 and before the Navy Mk 18 Gyro Gun Sight in my collection. 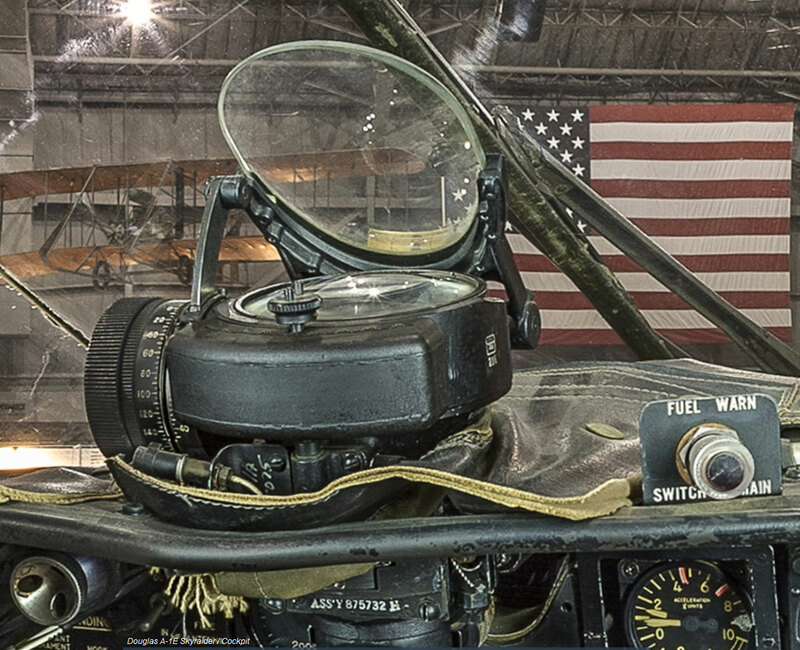 The Douglas SBD Dauntless (Wiki) used what amounts to a 3X rifle scope (Wiki) in a fixed mount at the top center of the instrument panel sticking through the windshield base. 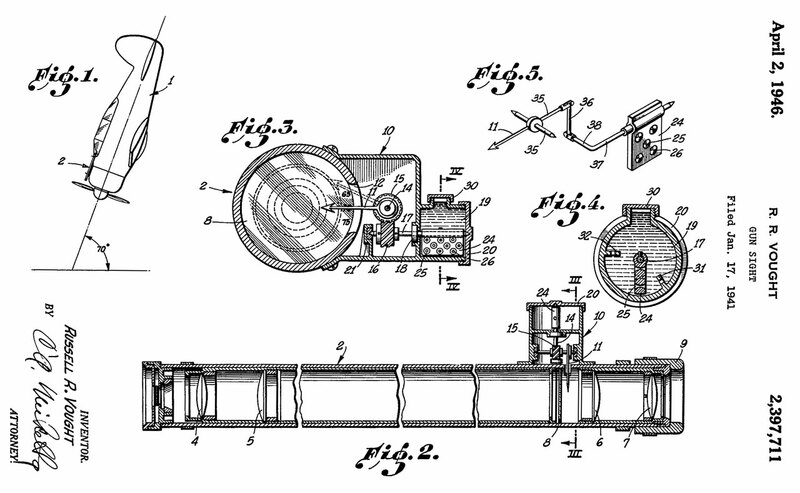 Note you can see the bomb sight is about 2 or 3 feet long and maybe a few inched in diameter. Also the dive brakes are deployed. 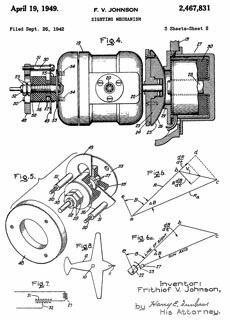 The most important thing to notice is that the bomb is far below the plane because a special bomb rack moved it outside the propeller disk. 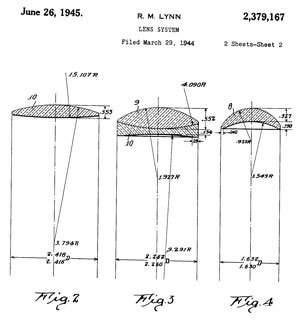 Since the bomb has a lower drag coefficient (Wiki) than the plane it speeds up after release and would go through the propeller if released from a conventional bomb rack on the plane's centerline. In the photo you can see that the bomb's nose is forward of the wing leading edge. 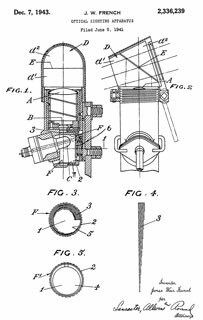 see Aircraft patents: 2386839 Bomb displacing gear & 2466980 Missile ejector for aircraft for examples of dive bomb racks. The SBD was a very successful plane and almost 6,000 were made. 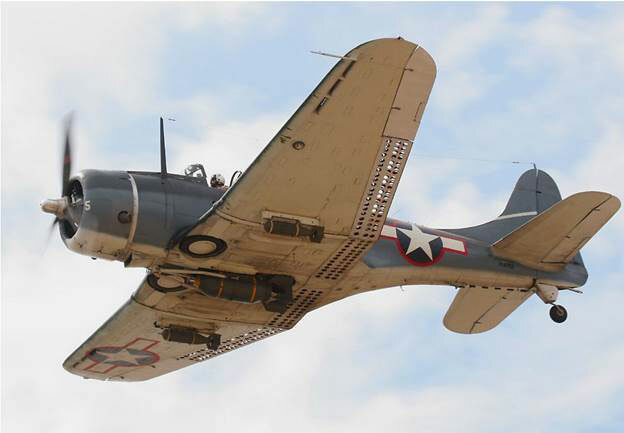 The Douglas A-1 Skyraider (Wiki) replaced the SBD as a dive and torpedo bomber. 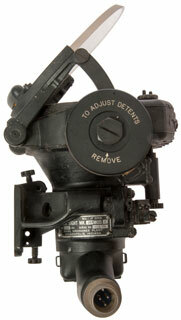 It used the Mk 20 Mod 4 sight for both dive bombing and it's fixed guns as well as other armament. 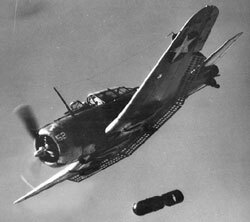 I've found YouTube footage of VNAF (Wiki) using the A-1 in dive bombing mode, but mostly newer footage is of dropping Napalm (Wiki) in low level horizontal mode, not dive bombing. Rockets (Wiki) are different than Missiles (Wiki) in that rockets have no guidance. The A-1 Skyraider can be armed with rockets, maybe either the standard 2-3/4" Folding-Fin Aerial Rocket (Wiki) or the 5" Zuni (Wiki). Note the Zuni has a 15 pound warhead and the 2-3/4" rocket a smaller warhead, so I don't see how they can be thought of as a replacement for iron bombs (Wiki: M117, M118, M81, M82, M83, M84, BLU-109, BLU-116) that range in size from 250 to 2,000 pounds. That raises the question is dive bombing a current thing? Note since dive bombers are slow moving they make easy targets for fighter planes, but when the U.S. is in active warfare they own the sky so that's not a problem now. 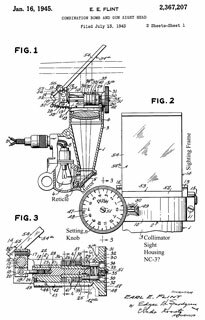 The miniguns (Wiki) fire to the left instead of forward. 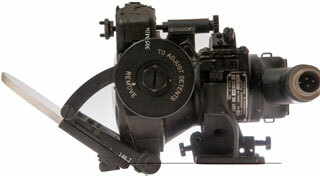 So the Mk 20 Mod 4 gun sight is mounted in the left window as shown in the photo. A cargo plane is used to carry the weight of the ammunition. 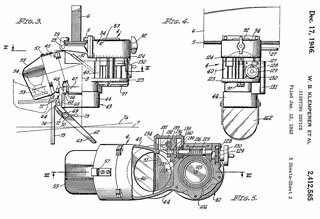 "The Mark 20 Mod 0 Sight was fitted mostly to Douglas Skyknights (F3D-1 and F3D-2); the Vought F4U-5N(L) Corsair and finally Grumman F7F-3N Tigercat and F8F-2N Bearcat. 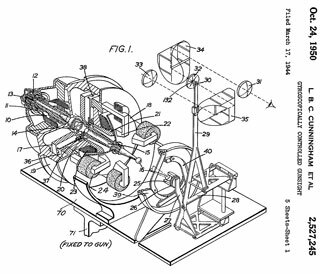 The Mark 20 Mod 4 was used mostly on Douglas Skyraiders (A4D-N, AD-5, AD-5N, AD-6) but also Grumman S2F-1 and some Air Force planes (see separate page on Air Force Sights)." 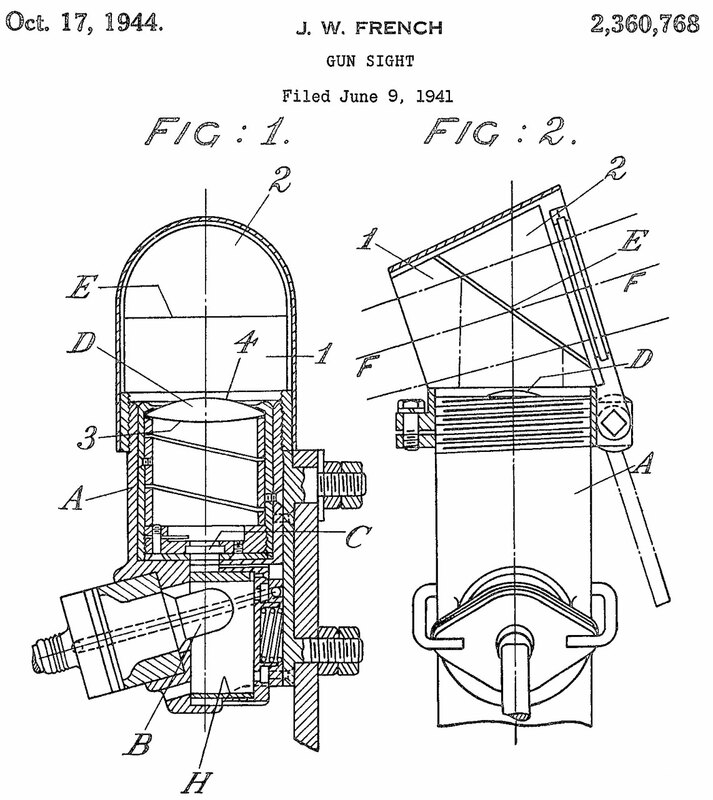 There are a number of ways to design a sight and most of them make use of optics. 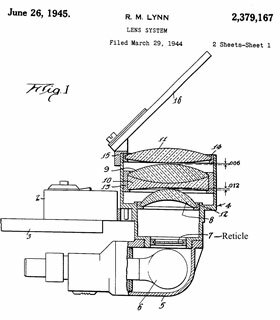 For some information and links to patents for Telescopic, Reflector (Reflex), Collimator and Holographic sights see my FN FAL web page. 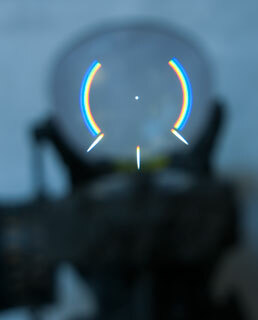 Note in the NC-3 the light goes through the green filter/reticle, then a 45 degree mirror then to the Collimator lens. 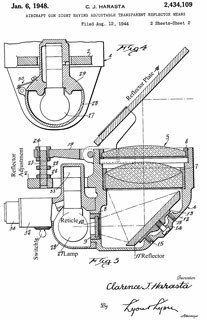 The plate behind the mirror has adjusting screws to align the light beam relative to the clinder and probably mounting holes. 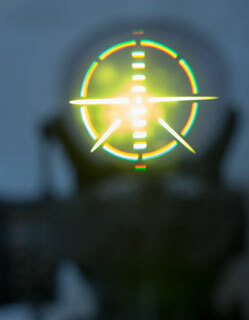 In the Mk 20 Mod 4 sight there is no mirror between the lamp and Collimator lens. 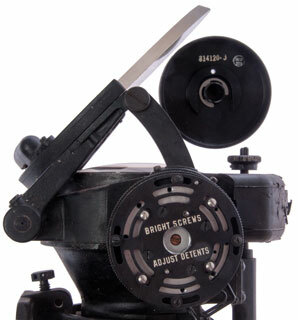 The NC-3 was a standardized assembly combining a lamp, reticle, color filter and Collimator lens. It does not come with the head that holds the mirror or the mounting for the mirror. That way each aircraft manufacturer can make a head that's customized for a specific aircraft. 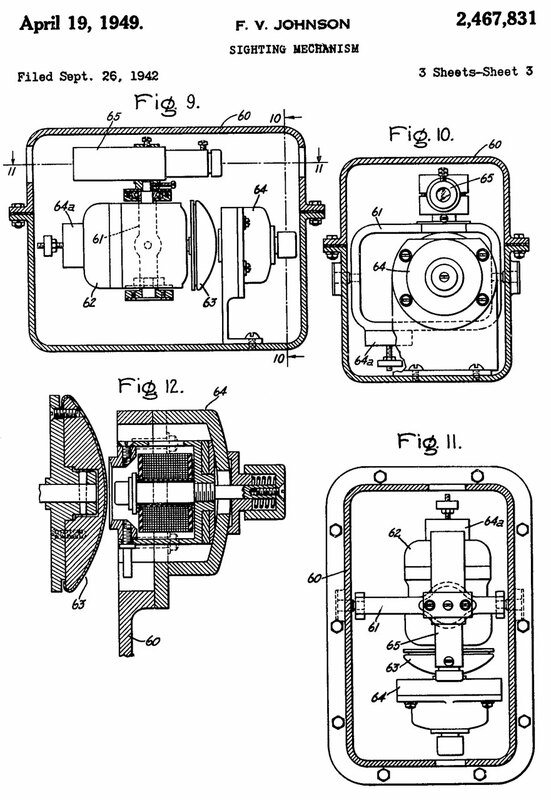 After W.W. II ended there were a large number of NC-3 units cheap on the surplus market and Edmund Scientific described a number of ways to use it as an optical Collimator. 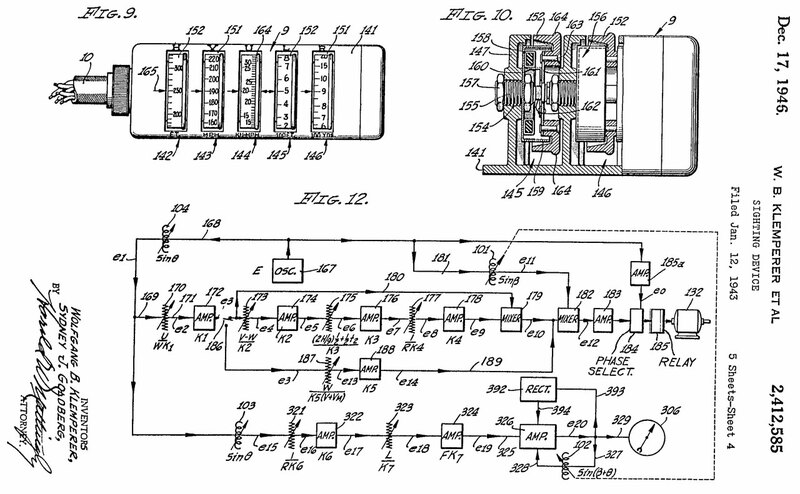 This particular N-3C Spec: 93-24817-A, Order No. : W33-038-ac-561, Mfg. by E.A. 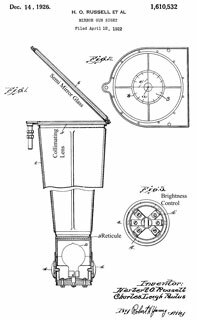 Laboratories, Inc. B'k'lyn, N.Y. uses a 222 penlight lamp, not the automobile stop lamp that was common on the earlier models. 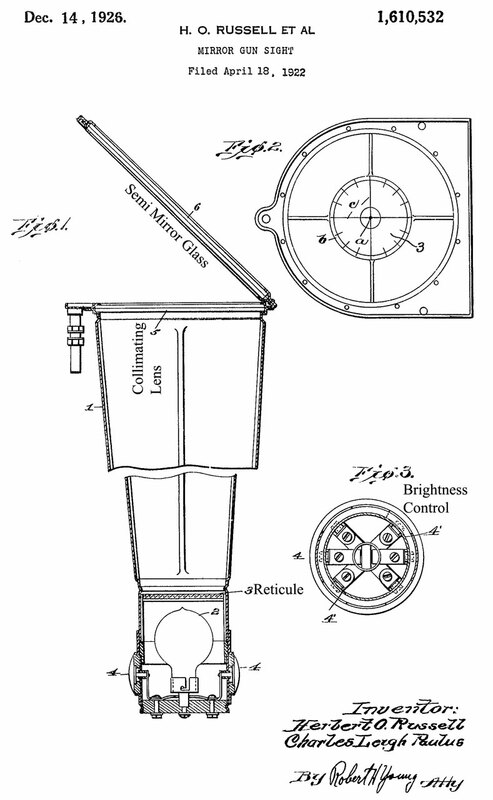 There is a hinged hatch at the rear to give easy access to the lamp. 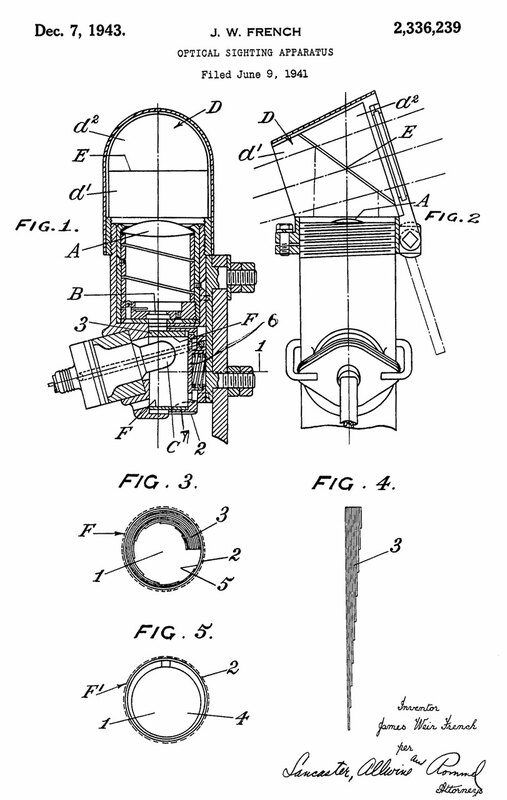 The cylinder where the head mounts is 2-5/8" dax x 2" long. 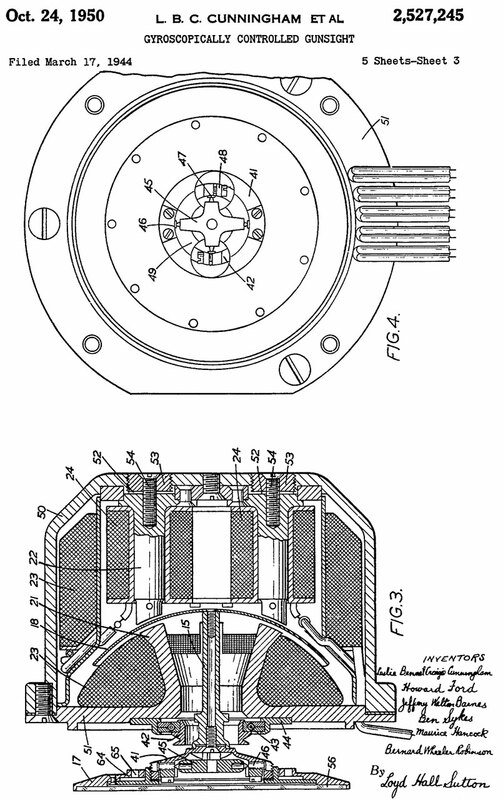 The working diameter of the lens is 2.140"
The connector has 3/4-20 threads, 2 male pins 0.06" dia. 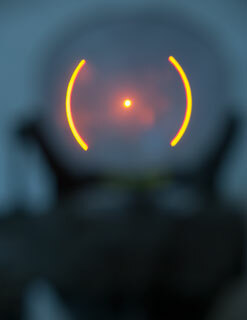 The Mk 20 Mod 4 Sight a lens diameter of 3.436" inside the metal ring that holds the lens, i.e. 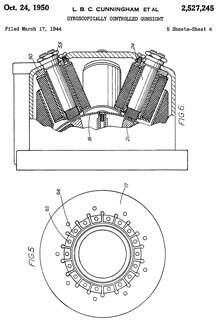 that's the working diameter. The mirror is 3-3/4" across the flats. 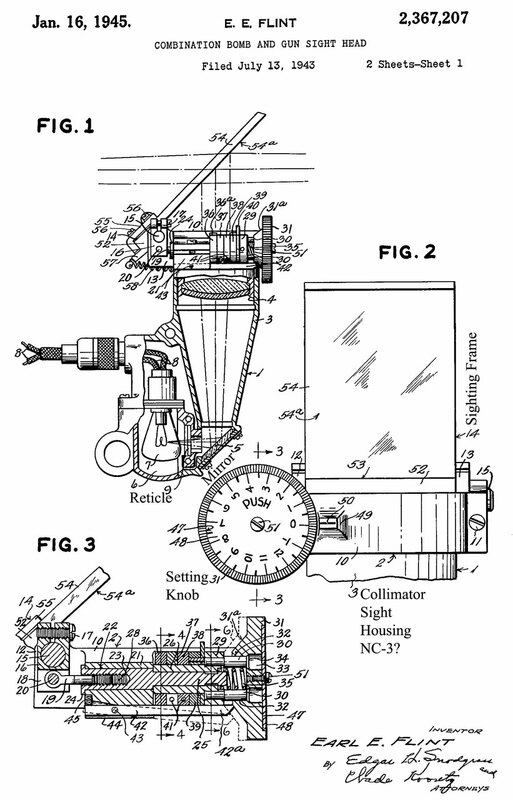 The US Navy Gunsights were developed based on the Barr & Stroud (Wiki, patents 2190569, 2284567, 2336239, 2339578, 2360768, 236415, 2377797, 2417330) sights. The book: Naval Airborne Ordnance NAVPERS 10826-A 1958 (1961) Aircraft Reference 17 mentiones that the pilot's eye needed to be aligned with the ring and bead made its use difficult. 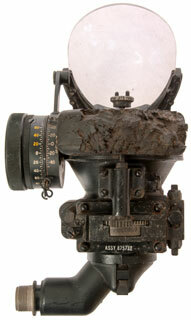 Optical sights are easier to use. 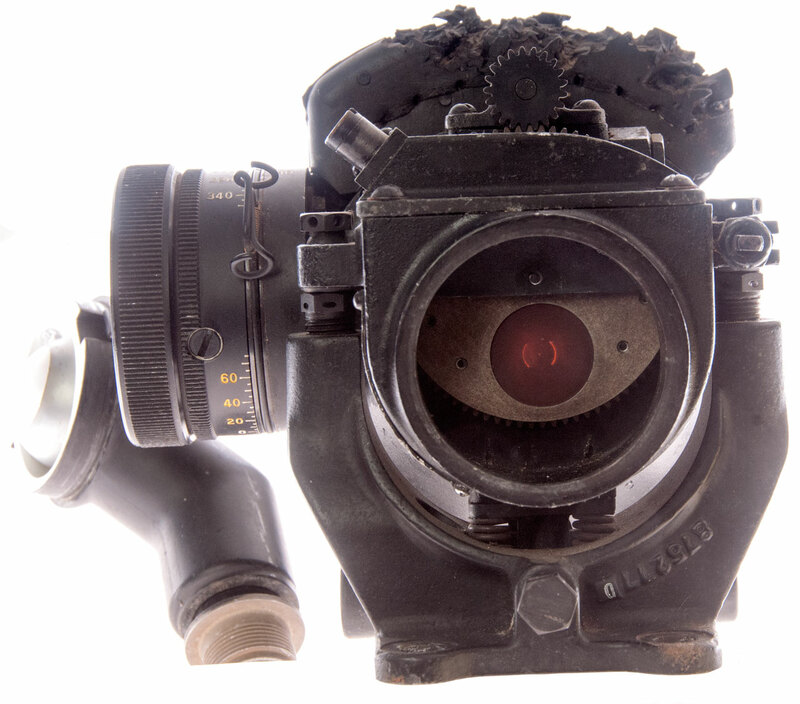 These were called "Gun Sights" even when they were excursively used as dive bombing sights. 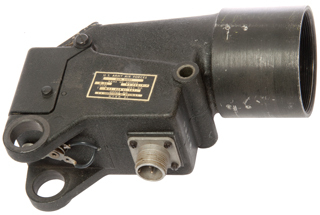 The Mk 20 mod 4 is a derivative of the Navy Mk 8 Illuminated Sight. These sights make use of the method of Stadia (Surveying Stadia, Wiki) to determine range to the target. 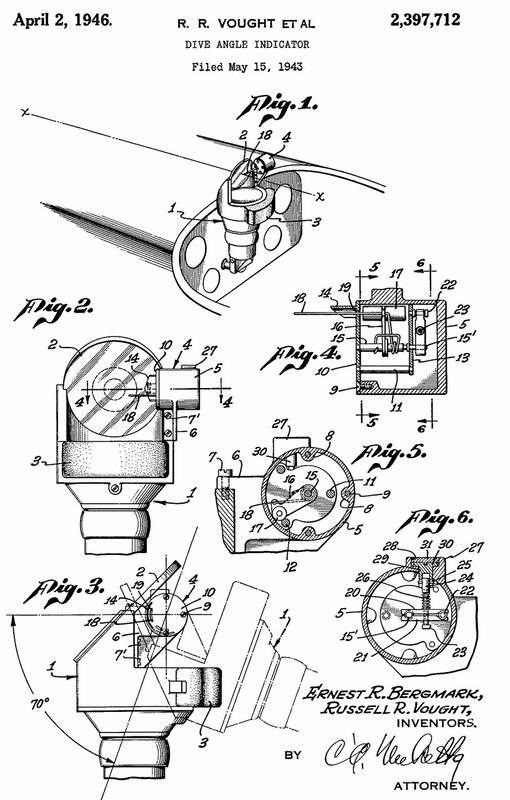 Drawing from Army, Index of Aeronautical Equipment, Volume 5 Armament, page 83. 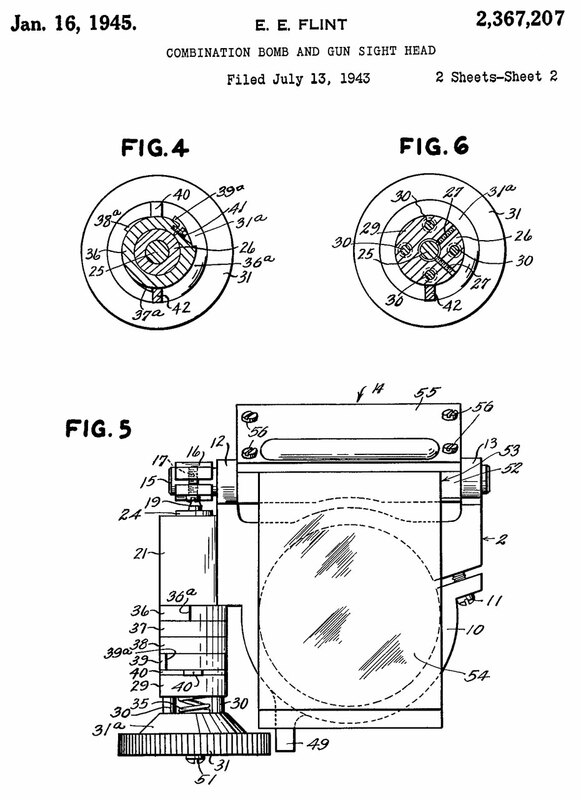 Maybe patent 2190569, 2417330 Fig 3? 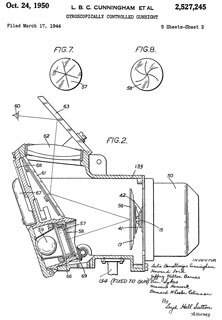 In any case it appears to be a very fast lens system, i.e. 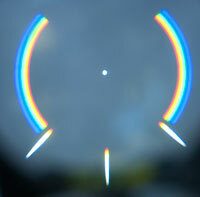 lens diameter is about equal to lens to reticle distance. 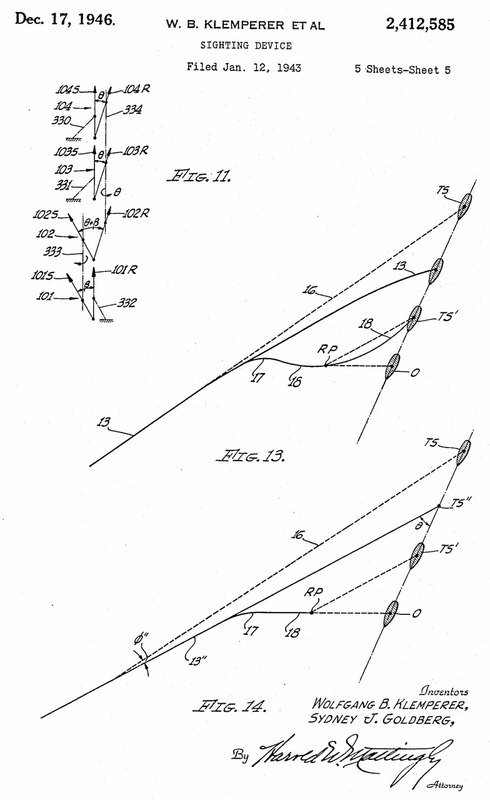 As an example of Stadiametric Ranging suppose the wingspan of a target bomber (Wiki: Heinkel He 177) is about 31 meters. At a range of 1,000 meters (about 1,000 yards) it would subtend an angle of 31 mills, so would be about 3/5 of a 50 mil reticle circle or 3/10 of a 100 mil circle. 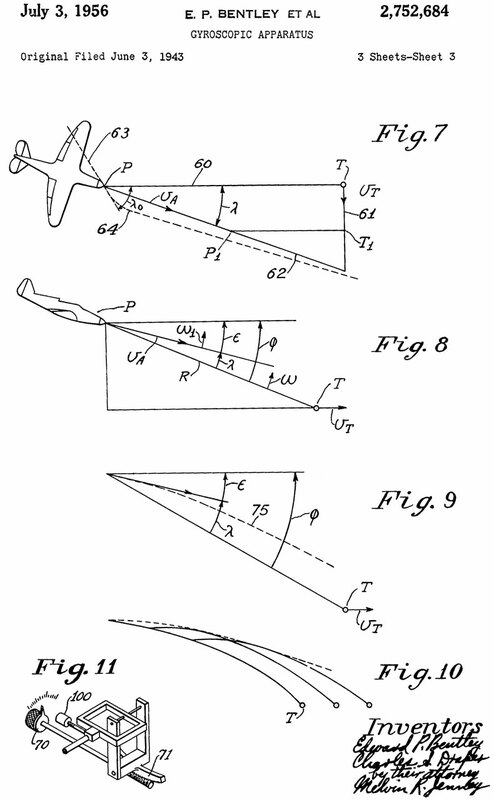 A fighter may have a wing span of 10 meters, so the pilot would need to have some knowledge of the wingspans of different enemy planes in terms of how they appear in the reticle at a desired shooting distance. On some sights there's a knob marked in mils with various German planes marked by type, i.e. ME109, He177 &Etc). 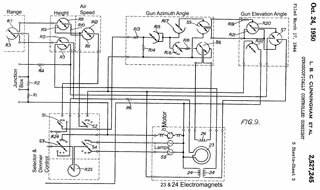 This unit consists of a Collimator where the reticle is projected on an optically coated glass plate in the head unit. 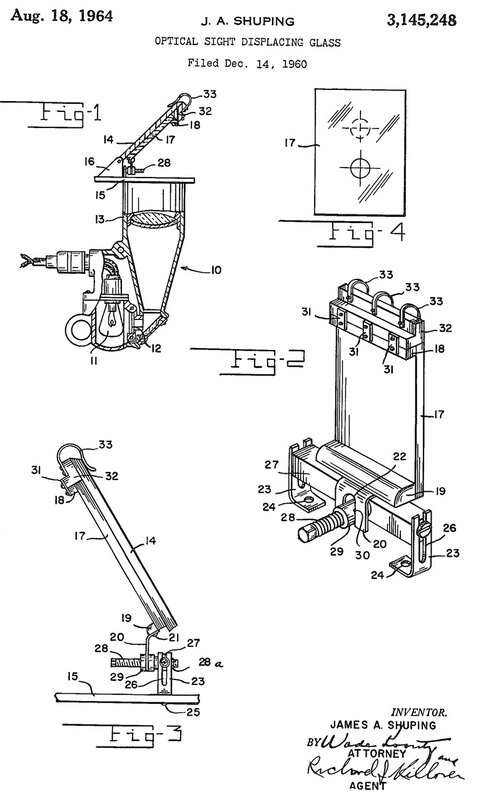 There are a couple of sheet metal springs that when squeezed allow removal of the lamp housing. GE Mazda 890 21 & 21C 28V lamp. 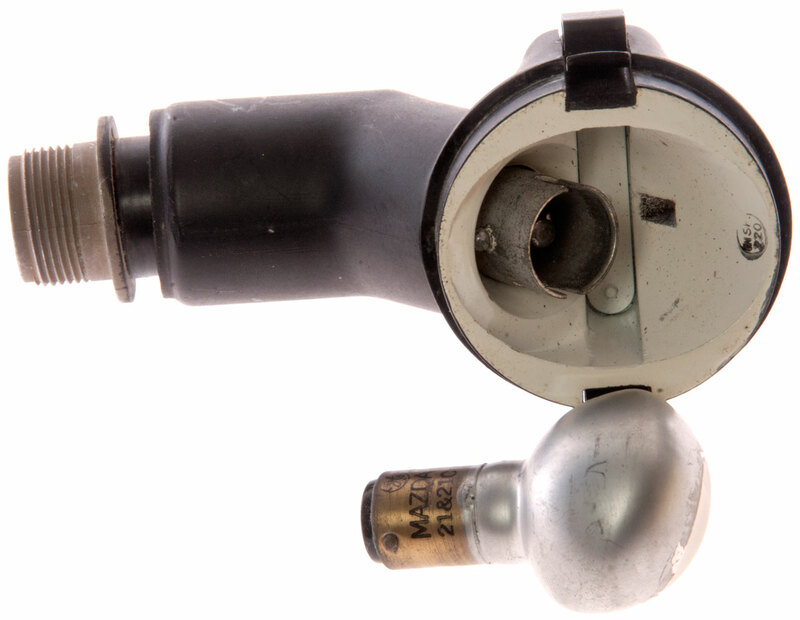 The two lugs are at the same distance from the bottom so normally could be installed two ways 180 degrees apart, but in this case it can only be installed one way because the glass bulb is not symmetrical. From the connector Ohm readings I expect a SPDT switch would be wired to select either Pin-A (filament A) or Pin-B (Filament B) with the other side of the power circuit going to Pin C. That way it would be quick and easy to switch in a new filament when one burned out. I found it very difficult to remove the lamp requiring removing the setscrew that holds the socket into the housing and pushing the socket up. 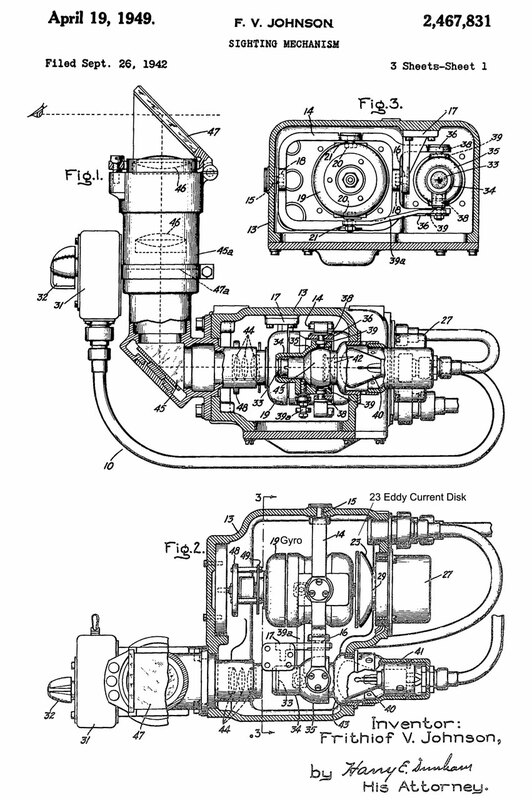 Note the pinch screw that holds the connector into the lamp housing is missing. 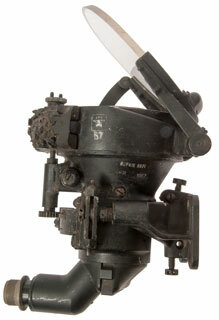 Note that the lamp housing can be rotated about the diameter where it mates to the sight. So it can point left, right, front, back or any angle in between. The socket in the photo has been pulled way out from its normal position in this photo. The mirror is not just glass, it has optical coatings on both faces that show up as color tints when the light is favorable. 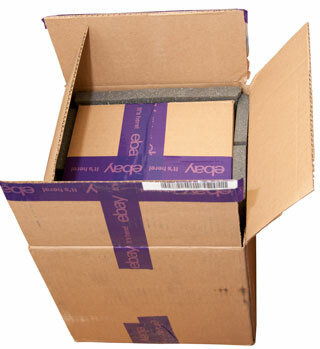 It's 3-3/4" wide x 1/4" thick. The angle of the mirror is adjustable by the large knob. 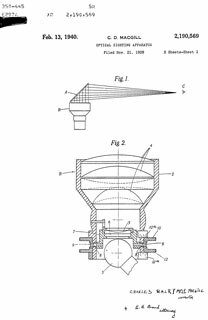 A goal of the optical design is to make the head as small as possible with a collimated output beam as large in diameter as possible. This requires what in camera language is called a very fast lens, i.e. 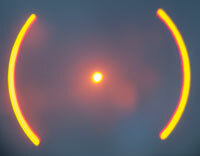 a lens with a very low f/number. Note that a 35mm camera lens rated at f/1.4 is considered fast. 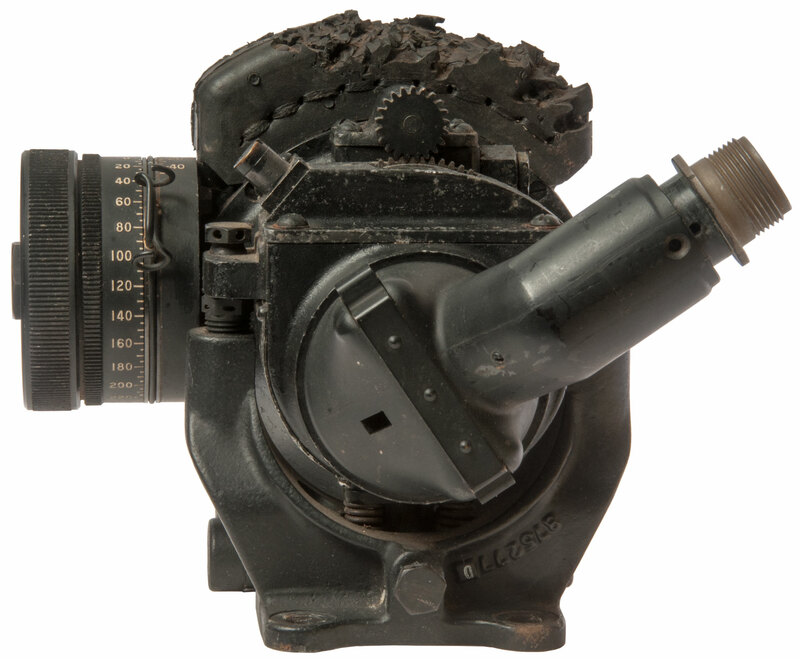 The output lens is 3.45" diameter and the distance between that lens and the Reticle is less than 3.3" so this lens has an f/number = f/D = 3.3/3.45 = 0.95. 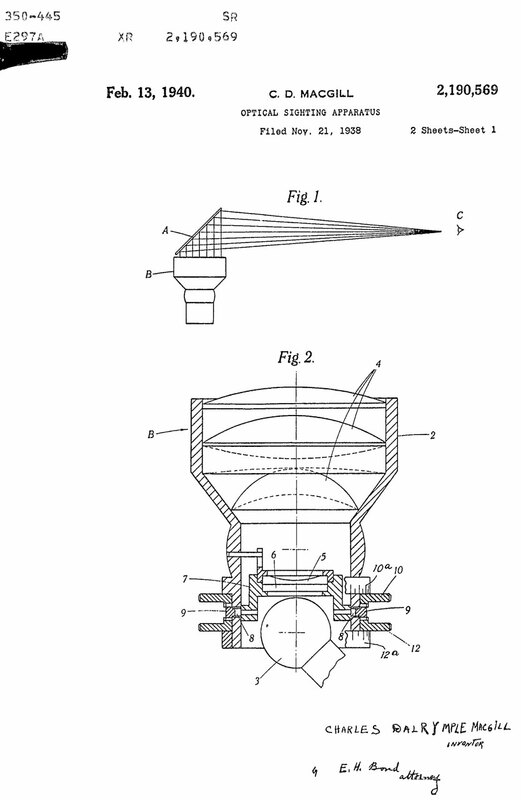 Note that for a Collimator (Wiki) the lens is operated with the reticle one focal length (f) from the lens and the output is a parallel light beam. 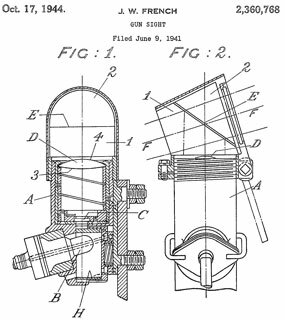 The Bar & Stroud patent 2417330 of 1947 Fig 3 shows an extremely fast lens system with f/0.73 and that has excellent color correction so the reticle image stays in focus when different colors are used. 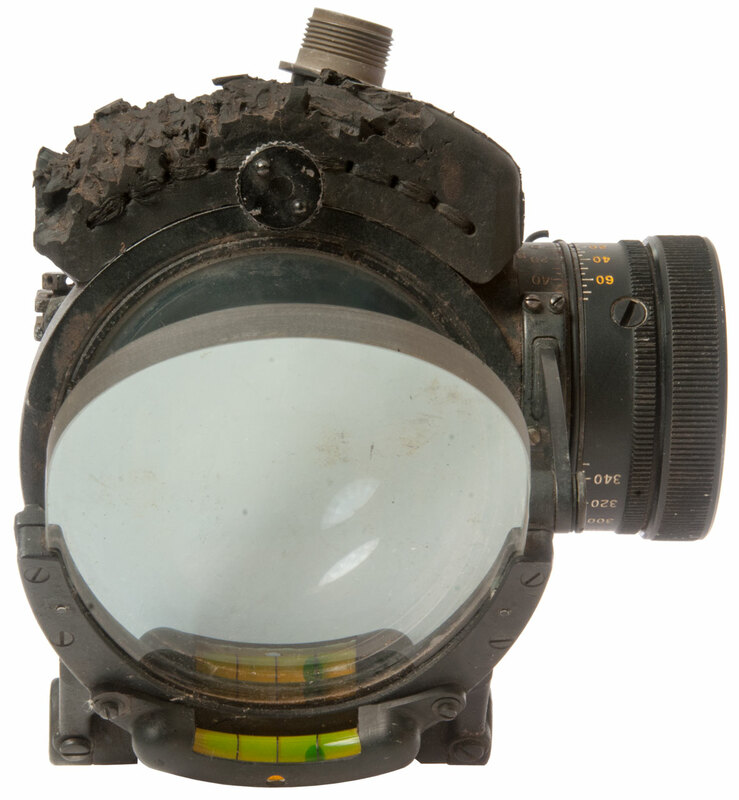 There are 3 reticles (Wiki) just above the lamp housing. One of them is selected by the knob with two pins. What is the purpose of these? When would each be used? There are holes on the filter - reticle wheel that should provide detents, but they are not functional. This would imply the Yellow Reticle in not related to the Yellow markings on the knob. 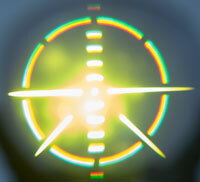 This is a 50 Mil reticle. O this "Ladder100 Mil reticle the steps are 20 Mils apart. Turning the knob tilts the reflector plate. 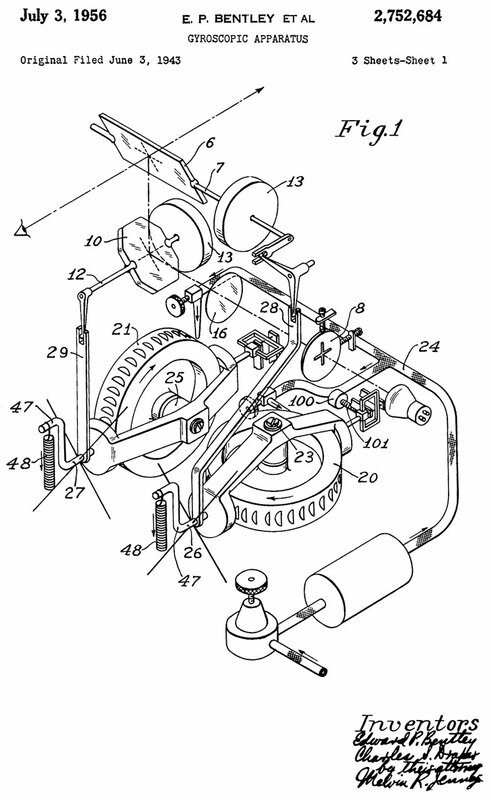 The knob is marked Mils (Wiki: Milliradian). There are 2000 * PI (6283.185 ) mils in a circle. At a distance of 1,000 a one mil change is 1. The units can be anything but they must be the same units, typically yards. The book: Naval Airborne Ordnance NAVPERS 10826-A 1958 (1961) Aircraft Reference 17, page 217 says "During a single million, the line of sight may be changed rapidly and accurately to the offset required for fixed gun firing and the releasing of rockets, bombs, or any combination of the three types and sizes of armament." The actual method of presetting the detent is covered in detail in OP 1671. There are markings both on the knob and around the index. The index is marked 40 - 0 - 40 MILS. The knob is marked in Yellow from 75 to 0 and in white from 0 to 350. But the actual knob movement is from 55 Yellow to 305 White which are the two settings in the below photos. 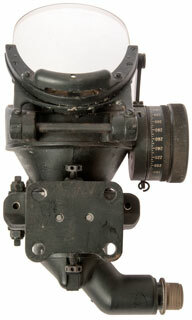 It may be that the yellow knob markings are related to the yellow reticle above and in a like manner the white reticle relates to the white markings. The difference between the extreme readings is 146.2 - 135.8 = 10.4 deg or 181 mills. 2 * Mils = Plate movement in degrees. The above readings are based on the white mark on the lamp support wire ring, not the zero index mark. So the 305 limit is really280 White and the 55 Yellow is really past 70 Yellow. But the delta readings stay the same. Note index markings of 40 to 0 to 40. Also note the white index on the lamp support ring that's not at the 0 index mark. The rubber crash pad has seen better days. where 135 degrees would be a 45 degree angle of the plate, so the zero index mark is not at 45 degrees. 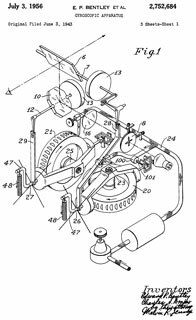 PS the (-) screw at the top right holds a spring that maybe should press a ball to form a detent for the reticle selection wheel. A Quarter is too big, so I used a wrench to remove cap to expose Detent adjustments. It appears that there a 4 detents possible.
? not set or 285 Knob will not turn past 285, but should turn to 350, why? There is a tall pin just above the letter "E" in SCREWS" and it must mate with the hole in the cap. Flashlight aimed at lens from top. i.e. for setting the knob zero. a small light. The numbers on the dial do not glow under UV. 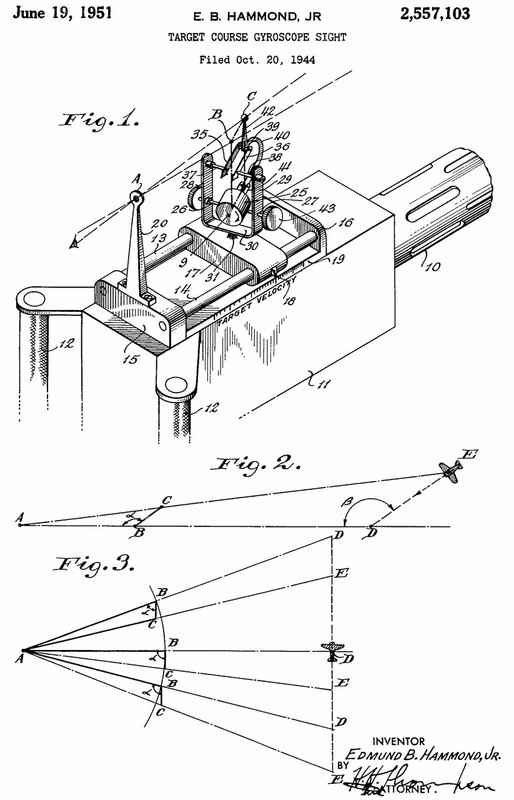 tilt of the sight relative to the mounting bracket. 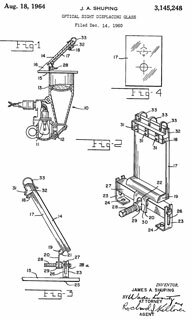 Mounting bracket with 4 holes. Castle nuts above and below it for front-back tilt adj. Nuts at left for left-right tilt adj. 1821431 Diving bomb sight,Gardner Grandison, 1931-09-01 -"...The steeper the dive, the more accurate"..."a fixed rear sight and a movable front sight adjustable in proportion to the altitude and airspeed..." pilot enters starting altitude and sight contains wind speed mechanism.
" 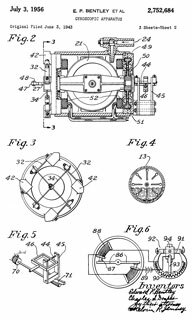 a single double-convex lens of the type having one surface of paraboloidal form and the other of spherical form in which the ratio of focal length to aperture can be reduced to a degree such as, it is believed, has only been obtained by means of complex lens combinations." 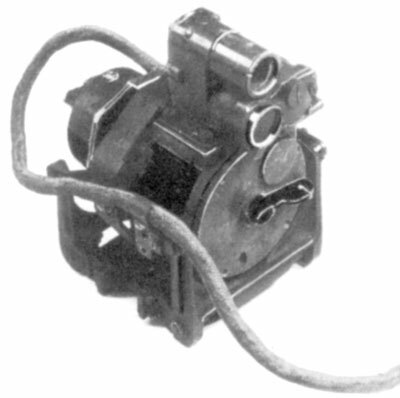 RE22330 Turn Indicator, C.S. 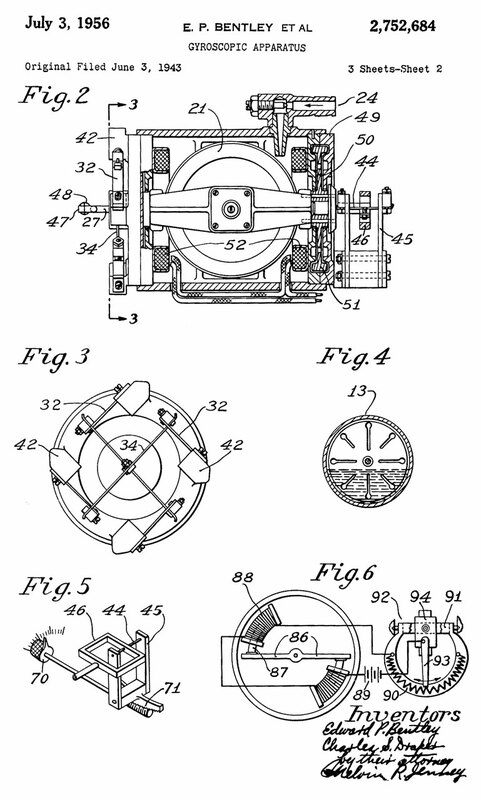 Draper, Sperry Gyroscope Co, June 8, 1943 - "... the amount of precession from the neutral position is approximately proportional to the rate of turn..."
2307590 Means for indicating turning movements of a craft, Theodore W Kenyon, SPERRY GYROSCOPE CO Inc, 1943-01-05 - intended for blind flying on board aircraft, but also used for the K14 gunsight used on navy ships for anti-aircraft fire. 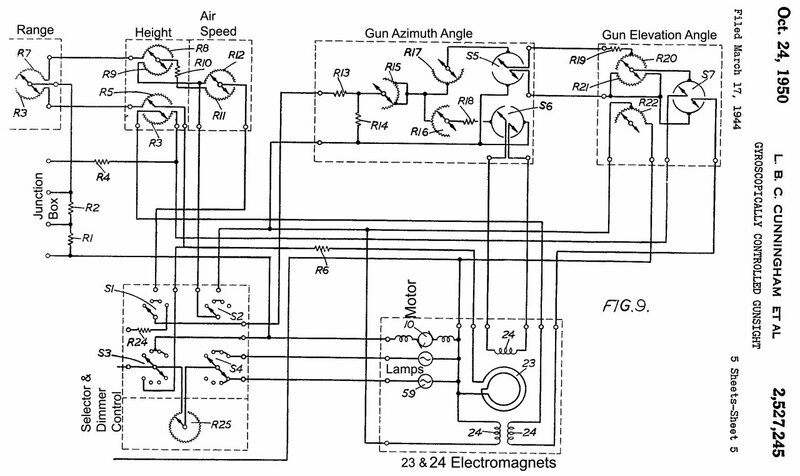 to change brightness of reticle a variable density optical system( Fig 3, 4 & 5) is used instead of a rheostat in the lamp circuit. drawings same as 2336239 above. 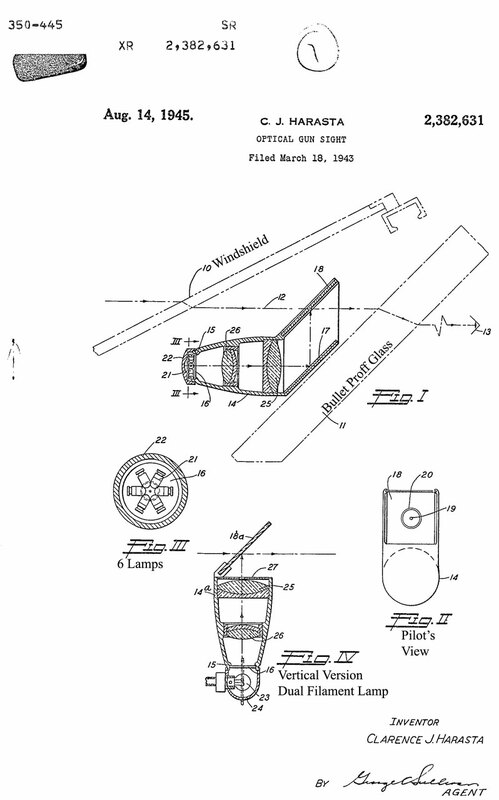 The hood is shaped to match the light cone going to the pilot's eye maximizing field of view. Later sights eliminated the hood. 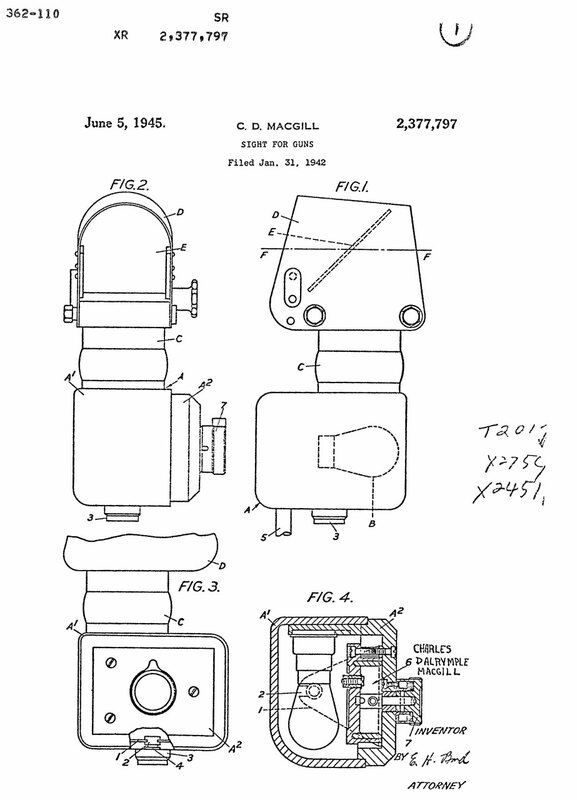 This patent covers the collimating optics, but appears to be the same as patent 2336239 above. 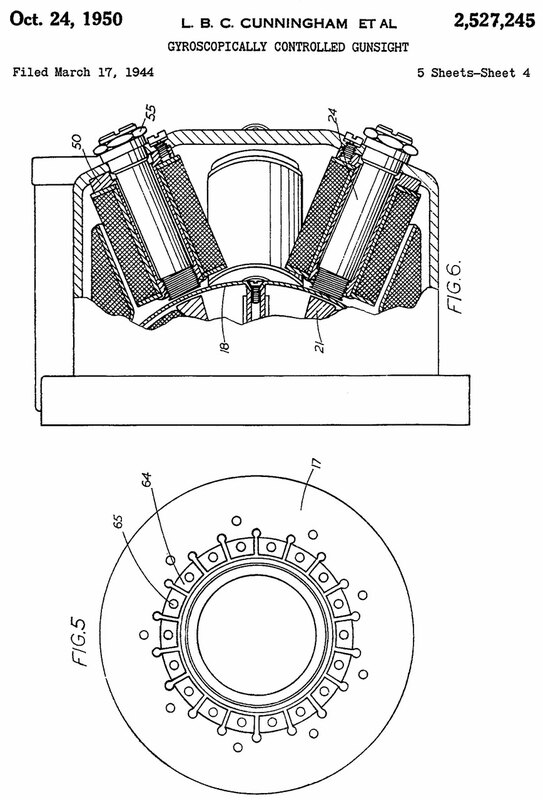 spherical bearing on optical axis to align - an expensive way - probably never used.
" adjusting means for combined gun and low altitude bomb ing sights, and has for an object the provision of adjustable sighting means for a collimator Sight that is simple and positive in operation, including releasable locking means for positively maintaining the sight in a gun sighting position, together with positive stop means for quickly adjusting the sight to a plurality of predetermined low altitude bombsighting positions." 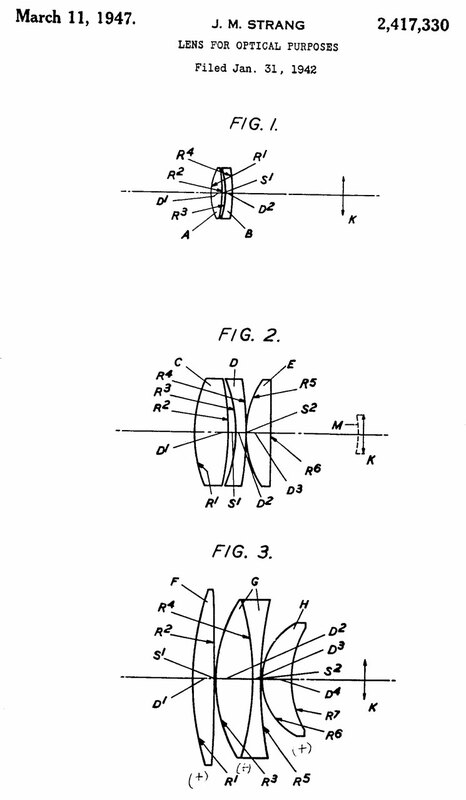 The system is composed of three lens groups (Fig 4, Fig 3 & Fig 2). 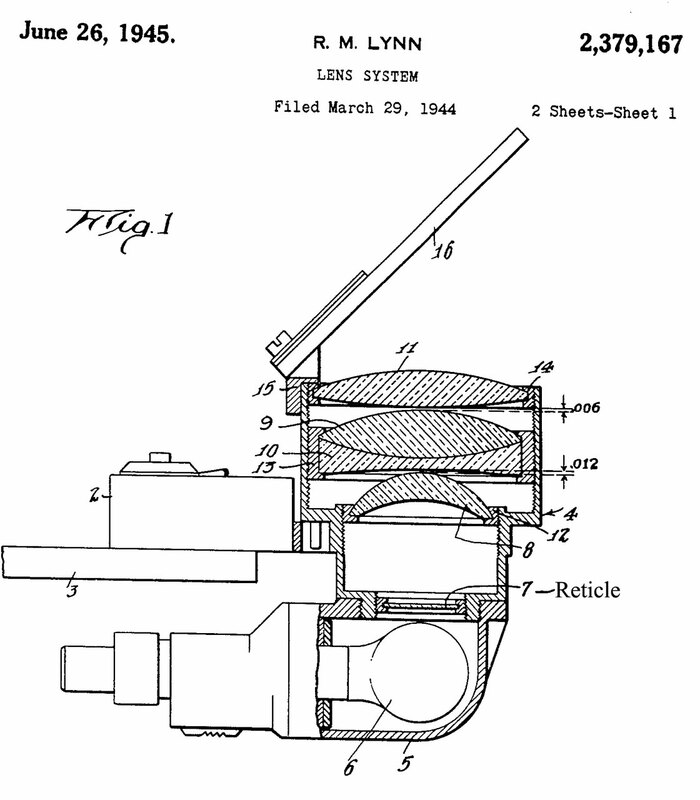 2382631 Optical gun sight, Clarence J Harasta, Lockheed Corp, 1945-08-14 - "As an example of current practice, government furnished sights for the P-38 have a focal length of approximately 7-1/2 inches with a working diameter of 2-1/4 inches and therefore must be so mounted that the semi-reflector surface is disposed at an angle of approximately 20 to the optical axis, requiring a very long and expensive reflector. By radically changing the design of the sight I have been able to produce an improved sight having the same working area or field of view in a focal length of 2 inches or less, and weighing but a fraction of that of the present design. 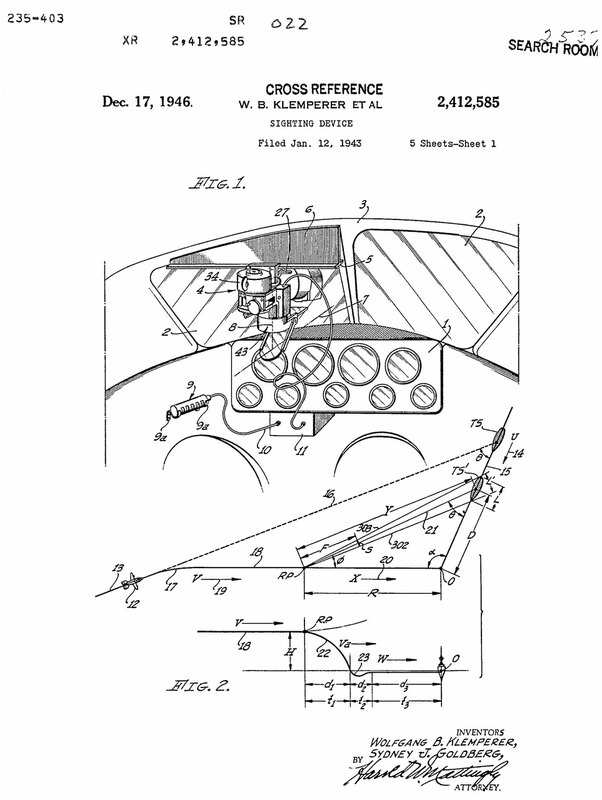 2384036 Torpedo Director, Wolfgang B Klemperer, Sydney J Goldberg, Douglas Aircraft Co Inc, 1945-09-04 - solves triangle: moving plane, moving ship, time from launch to hit -forward facing like gun or dive bombing sight. "An object of the invention is to provide a lens which is corrected for chromatic aberrations and coma and extremely well corrected for spherical aberration including zonal spherical aberration and which is very suitable for use at high apertures; i. e., about f/2.4 to about f/1.2 or even higher." 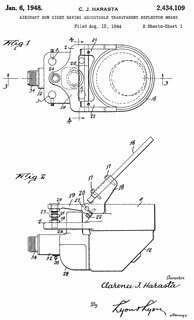 2397711 Gun Sight, Russell R Vought, Filed: Jan 17, 1941, Pub: 1946-04-02 - combines dive bombing sight with indicator to show a 70 degree dive angle (a 0 deg dive angle would be horizontal, 90 deg is straight down, and over 90 deg is upside down). 2. 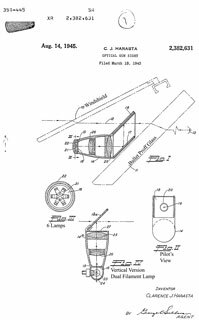 Swing-out bomb rack to move bomb outside propeller disk. 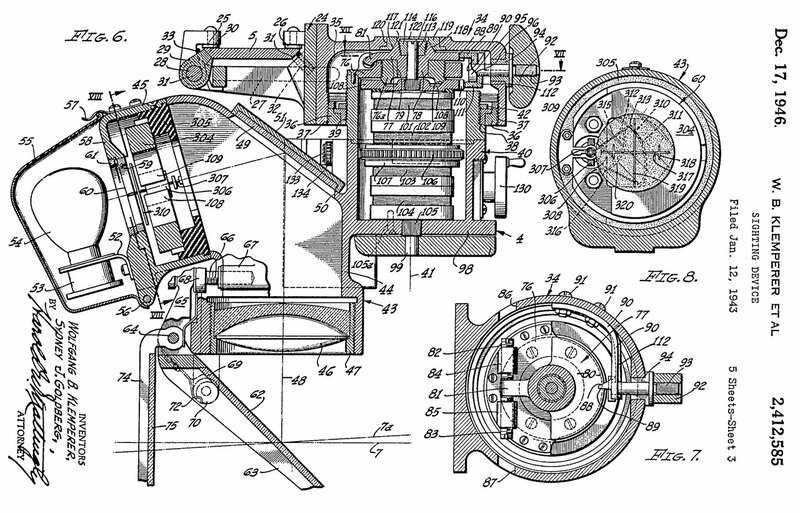 Because of the 1943 filing date this is probably the Mk 8 sight. 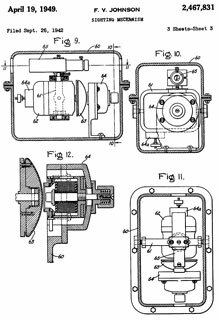 2405263 Bomb Sight, Robert M Lynn, 1946-08-06 - collimating reflex sight, bombs or guns, - azimuth and elevation movement of glass plate. 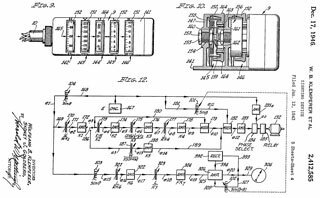 2412585 Sighting Device, Wolfgang B Klemperer, Sydney J Goldberg, Douglas Aircraft Co Inc, 1946-12-17 -for: Torpedoes, guns or bombs - analog electronic computer - requires 5 inputs (seems like to much to guess at). 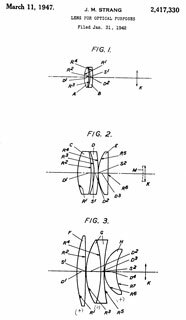 Compound lens with more corrections than simpler lens. 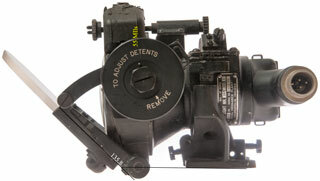 "..a lens in which the relative aperture, i. e. the ratio of aperture to focal length, Will be comparatively large and the lens well corrected for spherical aberration when used in monochromatic or approximately monochromatic light"
2434109 Aircraft gun sight having adjustable transparent reflector means, Clarence J Harasta, 1948-01-06 - earlier version of NC-3? 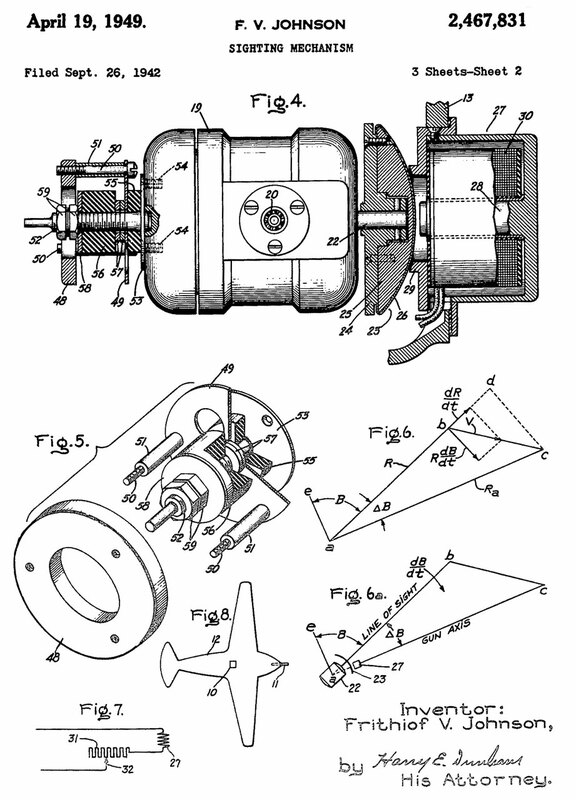 2354720 Low altitude bomb sight, Walter J Wagner, 1944-08-01 - add on to NC-3? 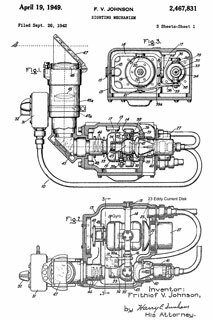 2461967 Aerodynamic Retarder, Leo J Devlin, Edward H Heinemann, Douglas Aircraft Co Inc, 1949-02-15 - "...actuated preparatory to initiating or terminating a. dive..."
1939517 Compensating gun sight, 1933-12-12 - single gyro? 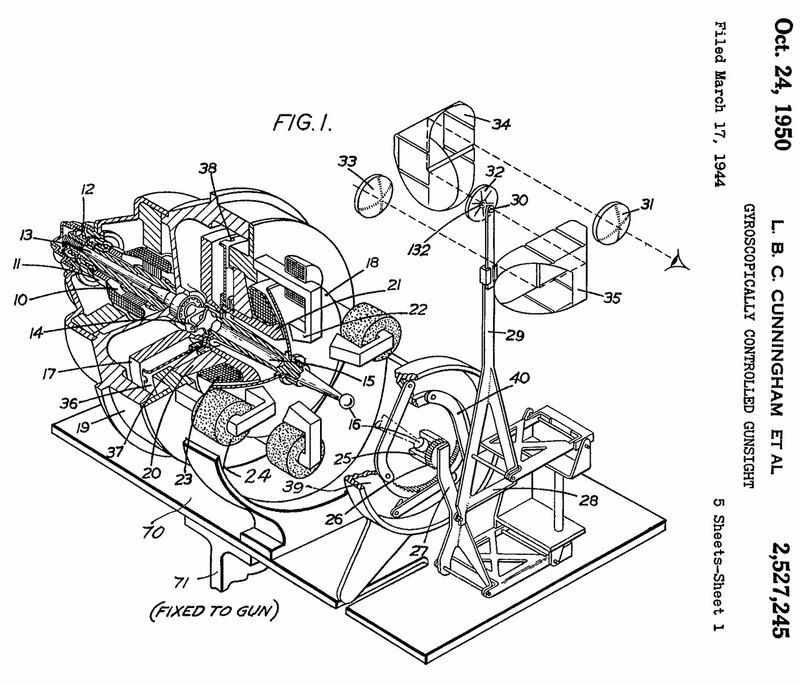 For use on flexibly mounted machine guns. 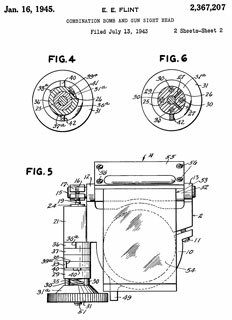 A Copper disk is influenced by electromagnets and Eddy currents allowing setting the pattern of dots in the display to match the size of a targets image thus determining and setting the range. So, providing a better lead computation because of more accurate range. British Mk I (Wiki) photo below from Wiki. The Mk18 is a direct duplicate of the Brirish MkII GSCGS (Wiki). appears to be for use on a flexible mounted machine gun, like in a flying fortress. 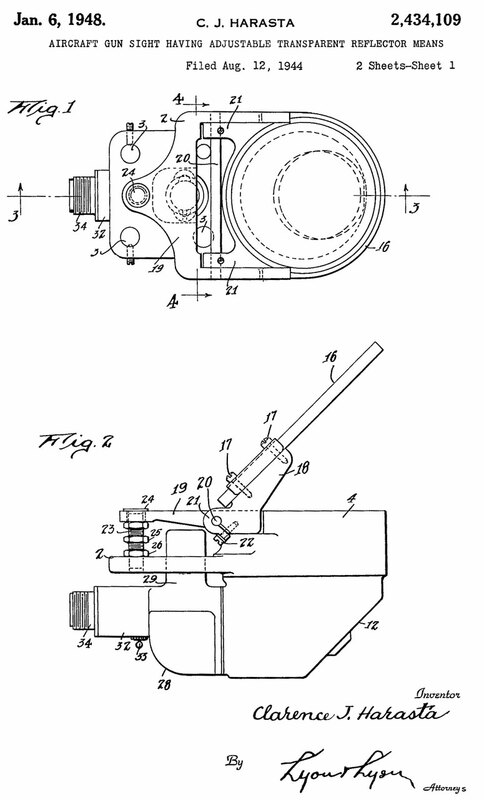 2949808 Aerial gunsight, James E Thurow, Motors Liquidation Co, 1960-08-23 - "The invention has for its principal object to provide a lead predicting type sight head of the above character which is a true spherical, coordinate, angular repeater and yields a spherical, coordinate angle presentation that is free of optical droop errors and does not need any electronic or mechanical compensation." - includes input from RADAR. 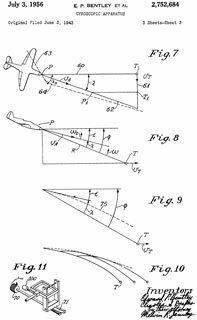 3145248 Optical sight displacing glass, James A Shuping, 1964-08-18 -"... a displacing glass attachment for reflex type optical gun sights to provide such sights with a low altitude bombing capability. " 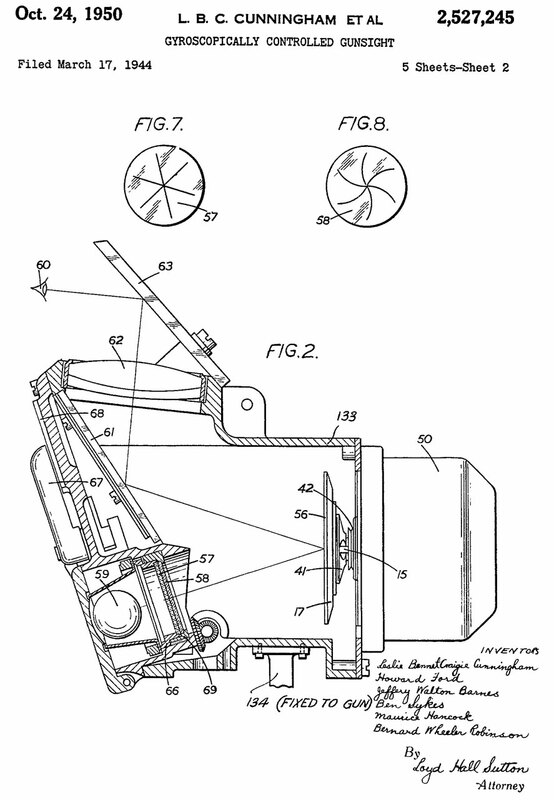 RAF Fixed Gun-Sight Installation in Hunter Aircraft, Dec 1954, DTIC_AD0101973 - Fixed mounting of the RAF Mk 5 Gyro Gun Sight instead of the prior two position mount to save weight and eliminate the problems caused by slop in the mechanism.